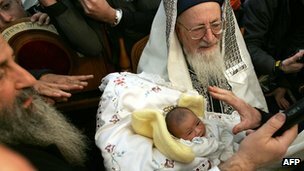 Dutch doctors should discourage the circumcision of boys, even from Jewish and Muslim families, says the Royal Dutch Medical Association (KNMG), because children cannot give informed consent. The KNMG says that there is even a good case for outlawing circumcision, but that a ban would drive the practice underground and might do more harm than good. About 15,000 boys are circumcised in the Netherlands every year. According to a KNMG medical ethicist, Gert van Dijk, 'We feel circumcision is a medically unnecessary form of surgery. The patient has to give consent, but children can't give consent and we feel that is wrong and a violation of the child's rights. In our code of medical ethics, it states that you must not do harm to the patient, but with this procedure this is exactly what you're doing." Most Muslims and Jews oppose the KNMG’s stand. "The motivation is plain Islamophobia. It's not a discussion about medical ethics, it's to make a lot of bad propaganda against Muslims and about our way of life and our religion," says Ibrahim Wijbenga, a Muslim member of the Christian Democratic Appeal in the city of Eindhoven, told the BBC. "Basically, it's an effort to stop Muslims from entering Holland."